This is from the very first edition of The Wright Stuff issued February 1999. At that time, the deterioration of concrete due to the presence of sulfate in the soil (sulfate attack) was a hot topic with building officials and inspectors in Las Vegas. 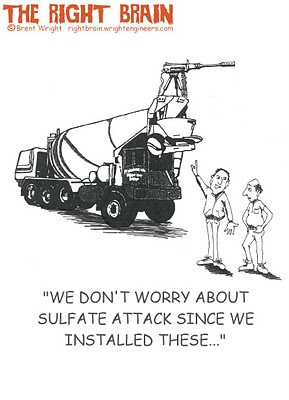 My solution was to mount machine guns on concrete trucks to fight sulfate attack.